I live in sunny Key West Florida, where I have little use for knitted items OR quilts, so I mostly knit for my landlocked and wintersick relatives and friends. I cook. A lot. And mostly I enjoy it, though in the summer I struggle with having an air conditioner that doesn’t quite do the trick and my kitchen sometimes feels as hot and sticky as, well, Florida. 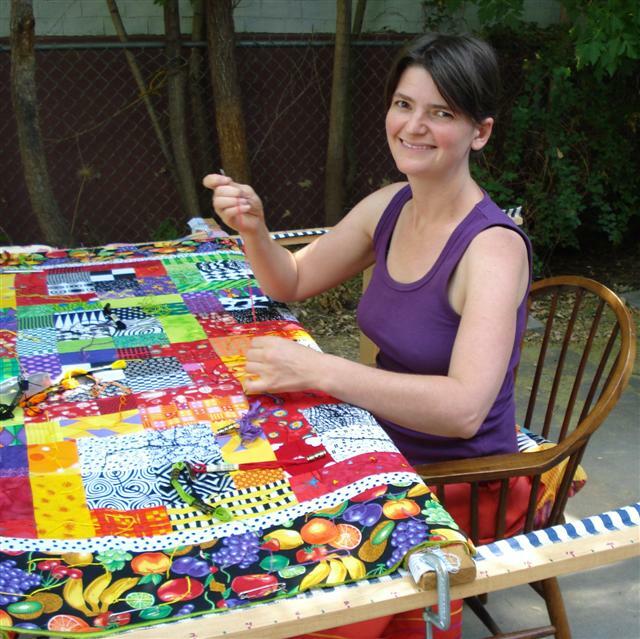 I quilted for about 10 years, before I discovered knitting. I lived in San Francisco for 3 years, where it is always knitting weather, and a scarf is de rigueur. During that time, I had a non-reliable sewing machine, and an even less reliable living situation, so my fibers spent lots of time in boxes being moved from neighborhood to neighborhood. If I had but unpacked my fabrics, they would have seen the Western Addition, the Richmond, the Mission, Bernal Heights, Haight Ashbury, and Pacific Heights. Only my scarves, hats, and mittens ever accompanied me out of the house; together we walked packs of city dogs and combed the chilly beaches countless times. I taught a few close girlfriends to knit right before I left SLC to live in SF. 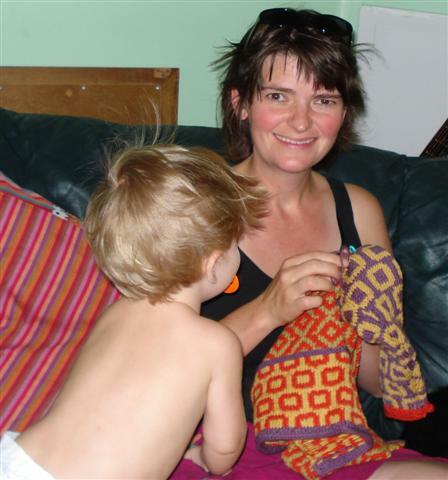 I struggled to find work in SF and was amazed to discover that one could indeed make a living teaching knitting (many of my students were children, as I was the teacher with the most patience for the very young). I was a shop-girl for one of the biggest yarn stores I’ve ever entered, ImagiKnit, and they sent me on so many private lessons. I traveled around, mostly by bike and bus, in my rain gear and super-dorky black helmet and saw some of the loveliest and grandest homes! I also walked dogs in the moss-drizzle, fog soup, the cake-knife wind, the crinkly sunlight, the near-warm salty breeze. I got chilled to my bones and didn’t warm up until Zach coaxed me away to Los Angeles. 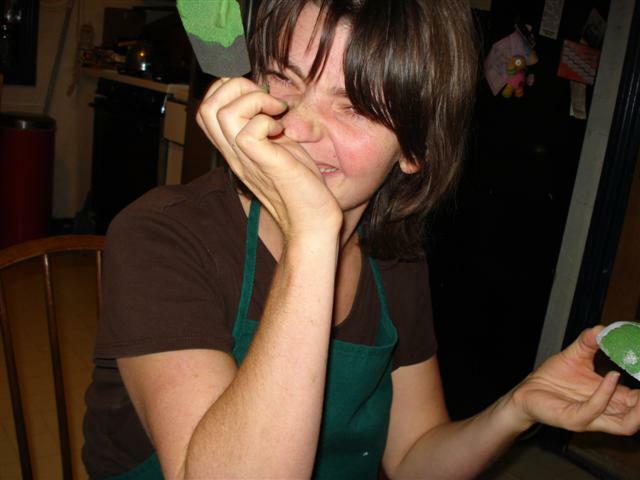 I moved back to SLC in spring 2006 for family reasons, and in November 2007 I had something of a creative surge (following a 9-month slump during which I was unable to produce anything artistic–gestating a baby took all my juice!). When I started feeling creative again in 2008, I went so far as to start this blog. I use it mostly to keep in touch with family and friends all over. How to cook delicious Indian foods using authentic and, to us, strange ingredients. Cooking and eating, reading, walking and swimming with the dog, staring at my kid and wondering at the miracle of producing a little boy, and sharing with that growing person the joys of math, language, puzzles, contraptions, nature, beauty, and hugging. Hee hee!!! New blog new blog new blog! I love this blog.I am not a blogging person by nature but I think I am about to have a serious addiction. Yeah blogging! !